South Korean media reported that Gen Ri had been executed earlier this month for corruption and "factional conspiracy". Last week, a meeting of the Central Committee of the ruling Workers' Party attended by Mr Kim discussed how to deal with corruption. While no individuals were mentioned, state news agency KCNA reported at the time that those at the meeting criticised "the practices of seeking privileges, misuse of authority... and bureaucratism manifested in the party". 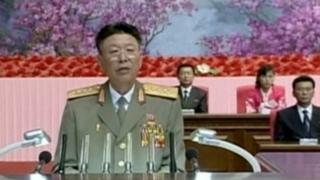 Who was N Korea's 'executed' general? North Korean leadership expert Mike Madden told the BBC rumours that Gen Ri had fallen from favour first surfaced late last year. However, "when previous chiefs of staff have been removed, they have re-appeared in other positions or been demoted. The only exception was Gen Ri Yong-ho who was removed in 2012 and then put under house arrest," Mr Madden said. "That being said, much of the information that South Korean intelligence sources have been giving to the media in the past year or so has turned out to be true," he added. Mr Madden also pointed out that it already seemed as though Gen Ri had been replaced when another general, Ri Myong-su, appeared at a recent rally in Pyongyang and was mentioned in the slot normally reserved for the chief of staff. If this is the case, he will be the fourth chief of staff since Kim Jong-un took over in 2011, as opposed to three during his father Kim Jong-il's 17 years in power. The reports of Gen Ri's execution come days after the North launched a long-range rocket, which critics say is a test of banned missile technology. In January the North carried out its fourth nuclear test. Some observers say the regime's recent behaviour may be linked to Kim Jong-un wanting to shore up his position ahead of a rare congress of the Workers' Party due in May. North Korea rarely confirms these reports of purges and executions though it did announce the death of Kim Jong-un's uncle and mentor, Chang Song-thaek, in 2013. Sometimes reports become completely fanciful as they spin around the internet - reports that Mr Chang was devoured by ravenous dogs were false. Knowing what to make of the executions and disappearances is also hard. Do they indicate the strength of the man at the top, because he can arbitrarily and brutally dispense with the people around him, or does it indicate weakness? It may be both. It may be that Kim Jong-un fears alternative sources of power and (like Stalin) pre-empts their rise. But it may also be that Kim Jong-un (like Stalin) sees threats where they do not exist. What is clear is that the leadership around Kim Jong-un is not stable. In May 2015 South Korea's spy agency told parliament that the North's Defence Minister Hyon Yong-chol had been executed for showing disloyalty to Mr Kim. The agency said Mr Hyon was killed by anti-aircraft fire in front of an audience of hundreds - it later said it was yet to verify the information. That news came weeks after the reported execution of 15 senior officials. Also on Wednesday, South Korea announced it was suspending operations at the jointly-run Kaesong industrial park in North Korea following the North's recent rocket launch and nuclear test. Seoul said all operations at the complex would halt, to stop the North using its investment "to fund its nuclear and missile development". The suspension will mean North Korea will lose the income it currently gains from the site, which comes to $100m a year (£69m).